Michael Miller from the Wallner Team represented us as our agent for buying a new home. He was outstanding in his willingness to help us! I would highly recommend him to you as an agent! Rodney Wallner listed our old house for us and had it sold on the second day! Rodney was amazing to work with in selling our old house. One of the greatest things about having the Wallner Team as our agents was that after you sell your house and put a contract on a new one, they have an incredible lady named Adrienne who will then help you with every detail from the inspections to helping find contractors to do the work when the home inspections require it. I would highly recommend that you use the Wallner team, it will make your moving experience a lot less stressful! The Wallner’s work for you, meaning when they list your home, they work to sell it, not just list and let another Realitor sell your home. When they are looking to find your new home, they are available when you are available. At closing, they are their with you, which makes the process so confortable and easy! Choose The Wallner Team, you wont be disapointed! Signed, happy seller and buyer!!! The Wallner team is the best realestate team out there. Great experience They are very courteous always available and on top of their game. Professional with a personal touch. Thanks to them my house sold in a great timely manner. Throughout the whole process of selling our home, the Wallner Team made us feel as ease. With every question and doubt my husband and I had, the Wallner team was there to answer our calls and our emails immediately. They explained the process each step of the way so we would knew what to expect. Selling our home couldn’t have been a better experience thanks to the Wallner team! Our sale involved a trust, and i was not familiar with the process. Our agent Laura Mueller used her expertise to help guide us through it and made the sale easy and quick! I would DEFINITELY recommend Laura and the Wallner Team! My husband and I are working with one of their agents (for the third time!). The process has been very professional and fast, and there is always someone available to answer questions and alleviate concerns. Adrienne and Jen were wonderful! They made the process smooth and as stress free for me as possible. Adrienne was quick with responding to my emails. Jen got buyers in to look at my condo quickly and sold it fast! Rodney & Jen did a great job selling our home. They also found us the new home we were looking for, despite their being no listings. The timeframe was tight, but they made it happen! They are hard workers & effective. We would highly recommend them. The Wallner Team has been truly amazing to work with. Within a 48 hour period, we had successfully purchased and sold our house. Our process moved very quickly, and the Wallner Team was always available to answer our questions. Jen and Rodney handled everything for us, making what would have been a stressful process enjoyable. We will be recommending the Wallner Team to everyone needing to sell their home. Working with the Wallner team was such an amazing, enjoyable experience. They have tons of knowledge and experience in the field and they always protected us as buyers and looked out for our best interest. Will absolutely be calling them again whenever it’s time to move! Initially our family was not looking to sell our house. My mother-in-law was moving into a new home and needed to sell the home she was living in at the time. My brother-in-law reached out to Rodney and Jen to see if they could schedule a consultation for his mother. He called on a Friday at 3:00pm and they agreed to meet with her the following day, Saturday, at 2:00pm. Rodney and Jen were polite and answered all of our questions thoughtfully and honestly. Their responsiveness stuck with me and so I called them a month later when my wife and I found a house we wanted to buy. Rodney and Jen came out to our home at the time, made several recommendations on repairs/upgrades, and sold our home within a month. We were able to move into our new home without the worry of having two mortgages thanks to the Wallner Team. Also, Adrienne with the Wallner Team was a pleasure to work with. Very responsive and respectful. I’m sorry it took so long for me to do this review but my brother dealt with The Wallner Team on my behalf and I got his input so I could complete this survey without further delay. He was very impressed with their professionalism and also appreciated connecting quickly with them when he had a question or issue that needed to be answered or resolved. I met them at closing and found them to be very intuned to my concerns and they handled the representative of the buyers with expertise. They are awesome to work with and I have and will recommend them to my family and friends. I still can’t believe that they listed my house on a Saturday and it had a contract the following Wednesday. The Wallner Team was a delight to work with! We had to put our house up for sale and move out of state. We basically trusted Rodney and Jen with all the details of making sure everything was being taken care of in the selling of the house. They were very thorough and did whatever was needed to make us feel comfortable and well informed about every decision that we needed to make. The Wallner Team has incredible expertise! They really do everything to work for you and make sure you get everything you want in the buying or selling of your house. We appreciate you guys Rodney and Jen! If it’s your first time buying a home or you have experience, you will come away from it saying they are fantastic! They knocked on doors in my kids neighborhood and found us a beautiful home. When it was time to move on they had a buyer in a few days and again knocked on doors to find a home meeting very specific criteria (close to our kids and on a golf course). In both cases these were not homes listed for sale. They are very professional and personal. They demonstrate the required sense of urgency and give you the necessary feedback to help make the process and transition seamless. We are very grateful to the Wallner Team for a job well done! My husband and I were impressed by their prompt attention, they came to our house for an interview the very first day after our call. This was our first time selling a house and were given all the necessary information our very fist meeting and not pressured at all, so we listed our house with them. We were so excited when we had a contract on our house on day 5!! We couldn’t be more satisfied and we highly recommend the Rodney and Jen Wallner real estate team. They are very professional and just genuinely nice people, you will love them! I could not be happier with both Rodney & Jen! Thank you both for walking me through this process and basically holding my hand! First time buyer by myself — overwhelming to say the least and you two made it very easy on me! So happy — and will refer you to everyone I know!!! 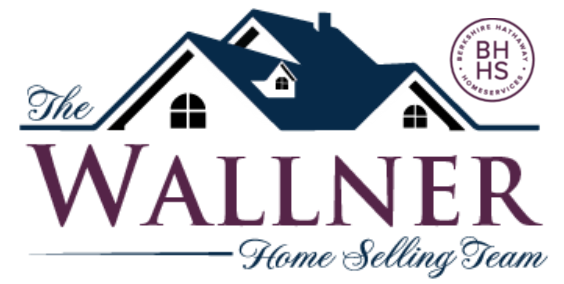 The Wallner Team was very professional and attentive to our needs. My wife and I were looking for our first home, with our first baby on the way, and they did an excellent job ensuring the process was stress-free and thorough. We were relocating from out of state and the Wallners helped us every step of the way. We needed to use all available technology in order to narrow down our selection and they provided us all the information we needed. When it came down to viewing the homes they were knowledgable on local values, renovating, quality of existing construction, and much more. I will be recommending them to anyone buying or selling a home.